What would a screen ad do for your business? Advertising at the Cinema is an effective, low-cost way to reach thousands of people. Our PowerPoint slide show runs 30 minutes prior to the start of the movie. We can help promote your business to a captive, attentive audience in a comfortable environment. Costs are low compared to on-air or print advertising, and studies show that retention is quite high among theater-goers. The Cinema was built in 1914 and is a cherished Rochester institution. We’re a friendly place with loyal customers who support local businesses – and our customers are spending money right here in the community. We make it easy to get started with a screen ad. We have a graphic designer on-staff who can take your existing marketing materials and adapt them for use as a screen ad. For custom design work, we offer reasonable pricing that depends on the complexity of your project. You can also provide us with the finished ad, if you wish. You can create your own PowerPoint ad (see our example ads for guidance). Or, you can send us a JPG or PNG file that we can then embed in a PowerPoint slide. Your graphic should have a width that is 2.22 times the height (so if your image is 1,000 pixels high, it should be 2,220 pixels wide). The exact size doesn’t matter, since we can stretch or shrink the ad to make it fit into the allotted space. For reference, the resolution of our projector is 2048×1080. Your ad can also be changed periodically to reflect special promotions or events. Get in touch with us, and we’ll make sure the whole process is simple and straightforward for you. In some cases, we charge an initial $50 set-up fee (the fee is waived if you provide us with the finished slide). Additional graphic support is available, with very reasonable pricing. Contact us for details. 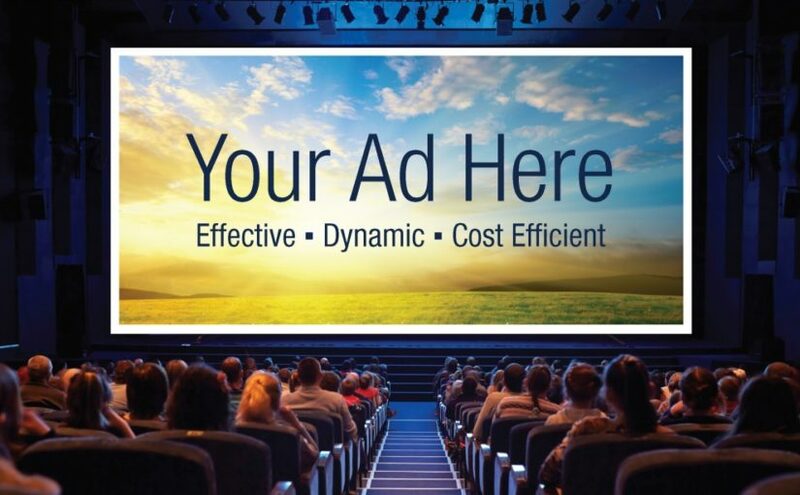 Contact Alex Chernavsky at alex@cinemarochester.com or 585.271.1786 for information about purchasing screen ads.